Captain Zodiac offers the Best Big Island Snorkeling Tours! 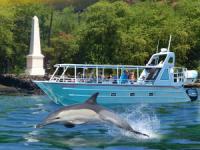 Join Captain Zodiac on a unique journey to Kealakekua Bay, Hawaii’s finest marine preserve and the site of Captain Cook's Monument. Captain Zodiac offers the Best Snorkeling in Kona Hawaii on board their exciting 24 foot Zodiac rafts. Captain Zodiac offers the best Hawaii Snorkel Tours, Whale Watching Tours and Rafting Adventures on the Big Island of Hawaii. Come experience Big Island Snorkeling Tours with Captain Zodiac Raft Expeditions and enjoy the beautiful pristine waters of the Pacific and its colorful aquatic life. Snorkeling the Big Island of Hawaii gives you access to some of the best diving and snorkeling in world! 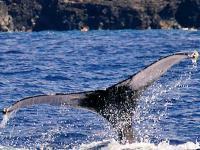 Hawaii Snorkel Tours are one of the most popular Hawaii Activities you can experience. The knowledgeable guides of Captain Zodiac will take you the best locations to snorkel in the waters off the Big Island! Captain Zodiac Snorkeling Tours employs knowledgeable staff that will help you identify the countless marine life that you will witness firsthand. See the most coral and over 220 varieties of marine life on a protected, calm snorkeling location. Captain Zodiac Raft Expeditions is the most experienced rafting company in Kona offering a variety of Big Island Activities including their Award Winning 4 Hour Captain Zodiac Raft & Snorkel Adventure, the 5 Hour "Beat the Crowd Mid-Day Expedition and a 3 Hour Whale Watch Adventure. Whether you are a seasoned snorkeler or going out for your first time, there are many things to know about enjoying your time under the sea while enjoying Snorkeling in Kona. 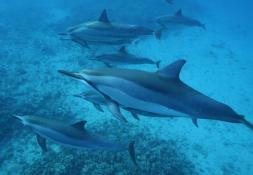 On these Hawaii Tours and Hawaii Activities you may see dolphins, manta rays, turtles and other marine life. The fast moving Zodiac boats provide excitement and are recognized as the best way to explore the marine environment. 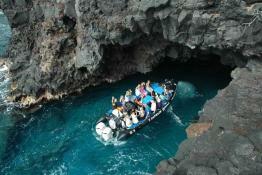 Only the Captain Zodiac boats can get close to the lava tubes, sea grottos, sea caves and wave powered blow holes. Once in the water with your snorkel gear you will see beautiful coral reefs, colorful aquatic life and so much more just below the surface of the pristine waters of the Pacific! The Big Island of Hawaii has some of the best snorkeling in the World! The Captain Zodiac tours stop at Kealakekua Bay for snorkeling. Kealakekua Bay is a National Marine Park and the location of the Captain Cook Monument. It is one of the premier Hawaii Snorkeling spots because of the incredible amount of coral and tropical fish. Enjoy great visibility and calm waters. The Big Island Snorkeling Tours include everything you need to get you snorkeling. While Snorkeling in Kona, you will be equipped with high quality gear and equipment. Captain Zodiac offers a Whale Watch adventure from January - April. The Zodiac rafts are at water level so you are right there with whales and marine life not 15 feet above them. Reserve Captain Zodiac Raft Expeditions for your entire party with Big Island Snorkel for the best Snorkeling in Kona. Captain Zodiac guides are knowledgeable and will take you the best locations to snorkel in the waters off the Big Island of Hawaii. So book today and save on Hawaii Snorkel Tours and Hawaii Activities!